These 1.5-inch diameter cylindrical Ninja Warrior holds are an incredible tool for training extreme grip strength. This is the little brother to the 2-inch diameter Pistons for smaller hands or for working a narrower grip. Work vertical-grip pull-ups. The naturally ergonomic design allows for open-handed training; the grip requires pure friction and will increase total hand strength and forearm strength. These types of grips are often seen on American Ninja Warrior and other extreme obstacle courses. Weather resistant textured sealant makes them great for limited use outdoors too! Grips: The grips are made of solid hardwood, textured with a light texture that will provide friction while not hurting your hands. Eyelets: Made of zinc plated solid steel, rated to 250 lbs each. 100% MADE IN THE USA. More specifically, the great state of Maine. How to get started: Begin by strapping these to a dumbell or small kettlebell to train this extreme grip strength with less weight, and increase your strength until you are able to do pullups and eventually swing back and forth. 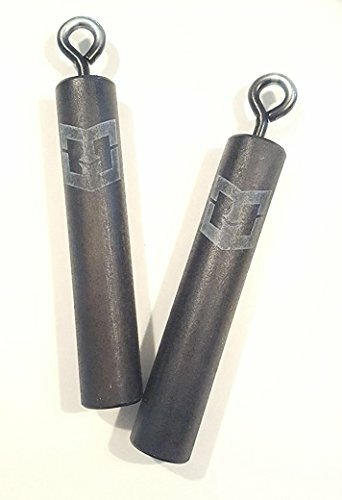 EXTREME GRIP STRENGTH TRAINING - 1.5-inch diameter, 8-inch long solid cylinders for training extreme grip strength. Challenging for professional athletes but still fun for kids! Rated to 250lbs each. Used by professional athletes at Ninja gyms, Parkour gyms and rock climbing gyms throughout the country. LIGHTLY TEXTURED GRIP will not hurt your hands and allows for no-slip grip. WEATHER-Resistant for limited outdoor use. If you have any questions about this product by Warrior Life, contact us by completing and submitting the form below. If you are looking for a specif part number, please include it with your message.